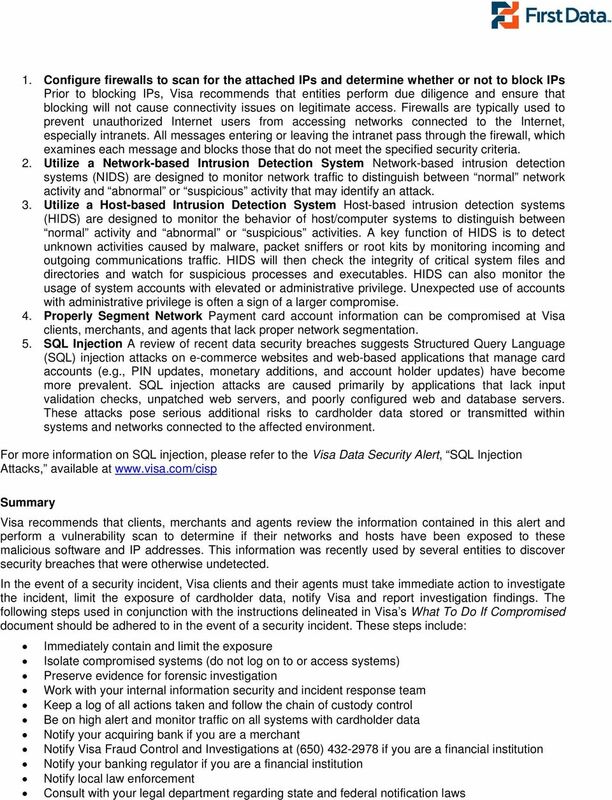 Download "For more information on SQL injection, please refer to the Visa Data Security Alert, SQL Injection Attacks, available at www.visa." 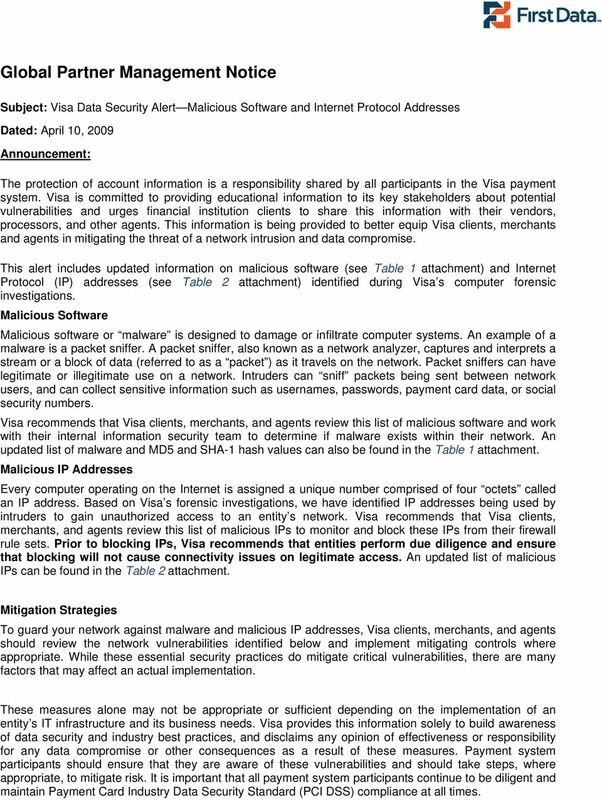 1 Global Partner Management Notice Subject: Visa Data Security Alert Malicious Software and Internet Protocol Addresses Dated: April 10, 2009 Announcement: The protection of account information is a responsibility shared by all participants in the Visa payment system. Visa is committed to providing educational information to its key stakeholders about potential vulnerabilities and urges financial institution clients to share this information with their vendors, processors, and other agents. This information is being provided to better equip Visa clients, merchants and agents in mitigating the threat of a network intrusion and data compromise. 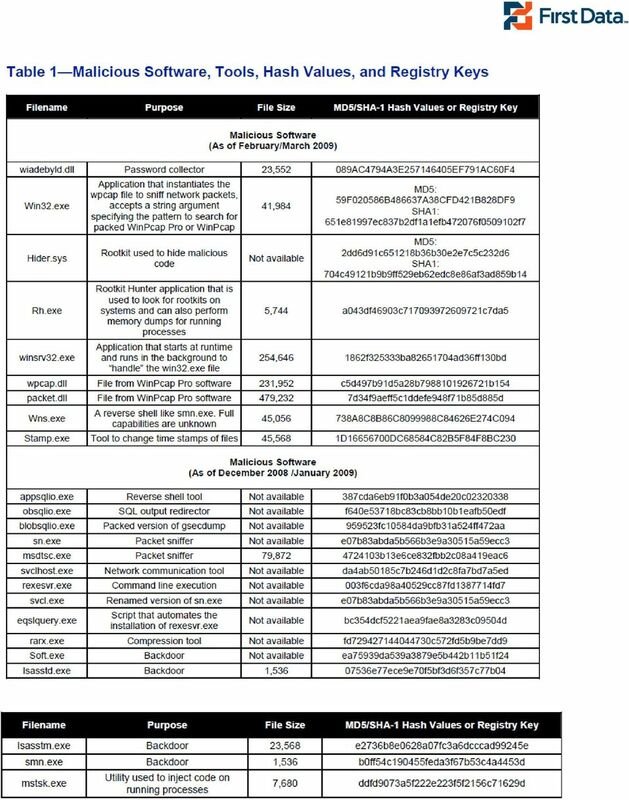 This alert includes updated information on malicious software (see Table 1 attachment) and Internet Protocol (IP) addresses (see Table 2 attachment) identified during Visa s computer forensic investigations. Malicious Software Malicious software or malware is designed to damage or infiltrate computer systems. An example of a malware is a packet sniffer. A packet sniffer, also known as a network analyzer, captures and interprets a stream or a block of data (referred to as a packet ) as it travels on the network. Packet sniffers can have legitimate or illegitimate use on a network. Intruders can sniff packets being sent between network users, and can collect sensitive information such as usernames, passwords, payment card data, or social security numbers. Visa recommends that Visa clients, merchants, and agents review this list of malicious software and work with their internal information security team to determine if malware exists within their network. An updated list of malware and MD5 and SHA-1 hash values can also be found in the Table 1 attachment. 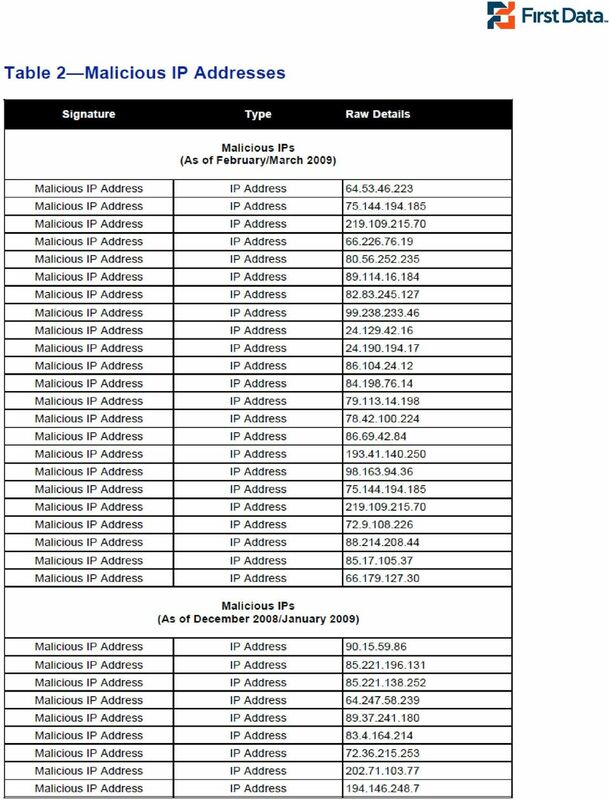 Malicious IP Addresses Every computer operating on the Internet is assigned a unique number comprised of four octets called an IP address. Based on Visa s forensic investigations, we have identified IP addresses being used by intruders to gain unauthorized access to an entity s network. 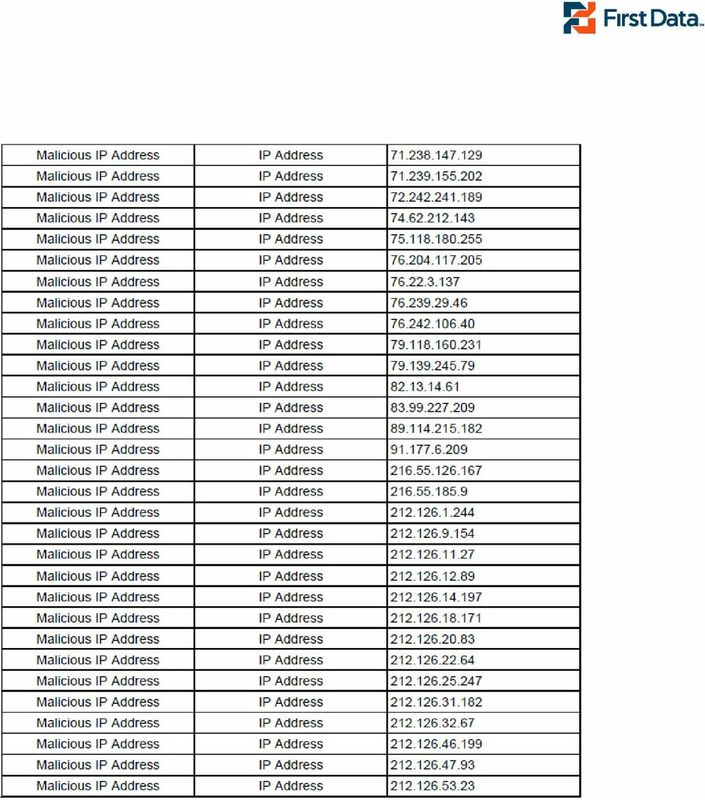 Visa recommends that Visa clients, merchants, and agents review this list of malicious IPs to monitor and block these IPs from their firewall rule sets. Prior to blocking IPs, Visa recommends that entities perform due diligence and ensure that blocking will not cause connectivity issues on legitimate access. 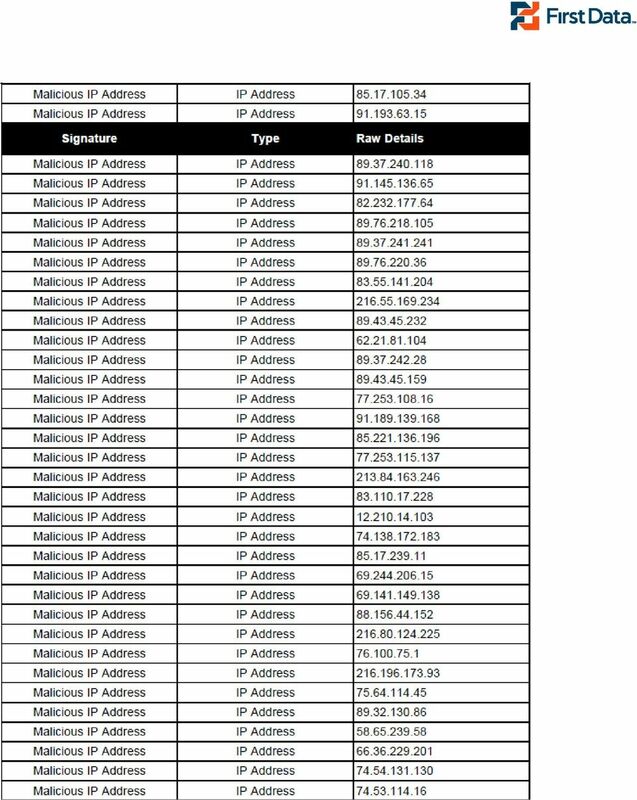 An updated list of malicious IPs can be found in the Table 2 attachment. 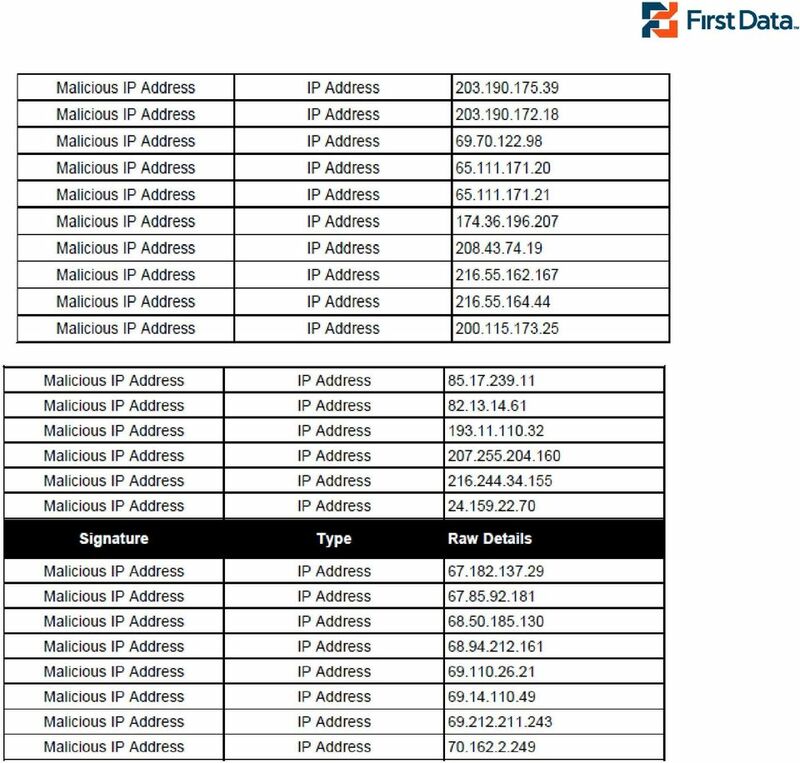 Mitigation Strategies To guard your network against malware and malicious IP addresses, Visa clients, merchants, and agents should review the network vulnerabilities identified below and implement mitigating controls where appropriate. While these essential security practices do mitigate critical vulnerabilities, there are many factors that may affect an actual implementation. These measures alone may not be appropriate or sufficient depending on the implementation of an entity s IT infrastructure and its business needs. Visa provides this information solely to build awareness of data security and industry best practices, and disclaims any opinion of effectiveness or responsibility for any data compromise or other consequences as a result of these measures. Payment system participants should ensure that they are aware of these vulnerabilities and should take steps, where appropriate, to mitigate risk. It is important that all payment system participants continue to be diligent and maintain Payment Card Industry Data Security Standard (PCI DSS) compliance at all times. 3 Visa may require the compromised entity to engage a Visa-approved Qualified Incident Response Assessor (QIRA). For a list of QIRAs, go to See Table 1 and Table 2 on the following pages. 9 Source: Visa Business News, April 1, 2009 Best Regards, Global Partner Management Team First Data Corporation First Data Corporation. All Rights Reserved. All trademarks, service marks and trade names referenced in this material are the property of their respective owners. The information contained herein is provided as a courtesy and is for general informational purposes only. This Alert is not intended to be a complete description of all applicable policies and procedures. The matters referenced are subject to change. Individual circumstances may vary. This Alert may include, among other things, a compilation of documents received from third parties. It should not be used as a substitute for reference to, as applicable, association releases, bulletins, regulations, rules and other official documents. First Data shall not be responsible for any inaccurate or incomplete information. This Alert may not be copied, reproduced or distributed in any manner whatsoever without the express written consent of First Data Corporation. Our Security. History of IDS Cont d In 1983, Dr. Dorothy Denning and SRI International began working on a government project. Payment Card Industry (PCI) Data Security Standard PFI Final Incident Report. Template for PFI Final Incident Report. Version 1.1.